28 n LER 2018 By Liam Dullaghan Jr. Liam Dullaghan Jr. is Vice President of Sales at Masteretch Services, a UK company that has been manufacturing chemical etching equipment since 1983. Laser2etch, a division of Masteretch, was launched earlier this year in an effort to make chemical etching more accessible to laser engraving and sign companies. Please feel free to contact Liam with any questions at info@ laser2etch.com. 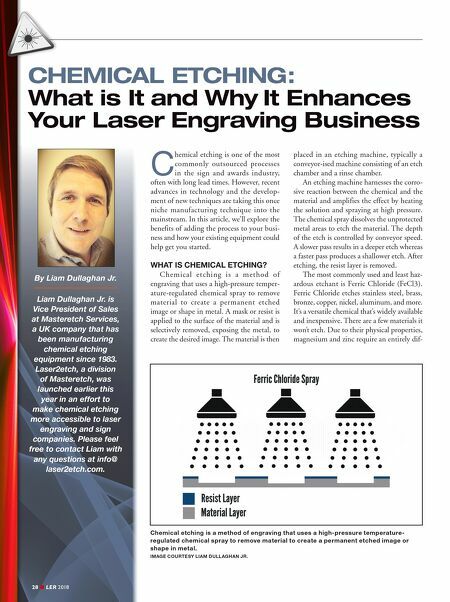 CHEMICAL ETCHING: What is It and Why It Enhances Your Laser Engraving Business C hemical etching is one of the most commonly outsourced processes in the sign and awards industry, often with long lead times. However, recent advances in technology and the develop- ment of new techniques are taking this once niche manufacturing technique into the mainstream. In this article, we'll explore the benefits of adding the process to your busi- ness and how your existing equipment could help get you started. 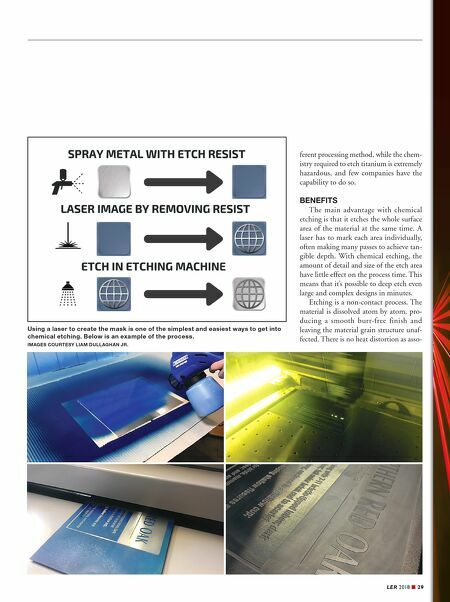 WHAT IS CHEMICAL ETCHING? Chemical etching is a method of engraving that uses a high-pressure temper- ature-regulated chemical spray to remove material to create a permanent etched image or shape in metal. A mask or resist is applied to the surface of the material and is selectively removed, exposing the metal, to create the desired image. The material is then placed in an etching machine, typically a conveyor-ised machine consisting of an etch chamber and a rinse chamber. An etching machine harnesses the corro- sive reaction between the chemical and the material and amplifies the effect by heating the solution and spraying at high pressure. The chemical spray dissolves the unprotected metal areas to etch the material. The depth of the etch is controlled by conveyor speed. A slower pass results in a deeper etch whereas a faster pass produces a shallower etch. After etching, the resist layer is removed. The most commonly used and least haz- ardous etchant is Ferric Chloride (FeCl 3 ). Ferric Chloride etches stainless steel, brass, bronze, copper, nickel, aluminum, and more. It's a versatile chemical that's widely available and inexpensive. There are a few materials it won't etch. Due to their physical properties, magnesium and zinc require an entirely dif- Chemical etching is a method of engraving that uses a high-pressure temperature- regulated chemical spray to remove material to create a permanent etched image or shape in metal. IMAGE COURTESY LIAM DULLAGHAN JR.